The movie Vettaiyadu villaiyadu is a widescreen presentation. Harris Jayaraj was so delighted with the place that new ideas for composing tunes had crept up in his mind. Producer Narayanan is much more happy as the film is in his hands and he is sure that Kamal Hassan will acheive the best and come out with flying colours. 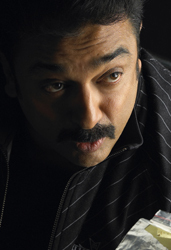 Kamal after camping for over a month, completed the schedule for Vettaiyadu villaiyadu at US and he is back in Chennai to resume the shooting for the other segments of the film. Meanwhile, he has left on a short trip to Malaysia to participate in a function. Once back in Chennai he would also double up the pace for the story discussion of his next ambitious project, Dasavatharam. It was Kongu Tamil in Sathi Leelavathi and Hubli..
Trisha says yes to Chiranjeevi but no to Balakrishna and..